Quinoa is a complete food due to the presence of protein and amino acids, as well as essential fatty acids and carbohydrates (James, L.E.A., 2009). This ancient indigenous crop has grown in global popularity over the past few years as a superfood and amazing source of plant protein. Commonly mistaken for a grain, quinoa is, in fact, a seed from the Chenopodium genus. Quinoa (Chenopodium quinoa willd.) is a seed of the goosefoot plant and has an innate ability to thrive and flourish under strenuous conditions as well as in sol with low agricultural input or high salinity levels (Bharagava, A., et al., 2013). It is closely related to beetroot and the dark leafy green chard than it is too common grains. Quinoa is known as a pseudocereal as it is not a true cereal grain, similar to amaranth and buckwheat. A pseudocereal refers to a seed of a broadleaf plant and not a grass, such as wheat. Native to South America it was domesticated over 5000 years ago (Arneja, L., et al., 2015) where it has been a vital source of food in the Andean Region since 3000BC, only second in prominence to maize in the Incan Empire (Bharagava, A., et al., 2013). 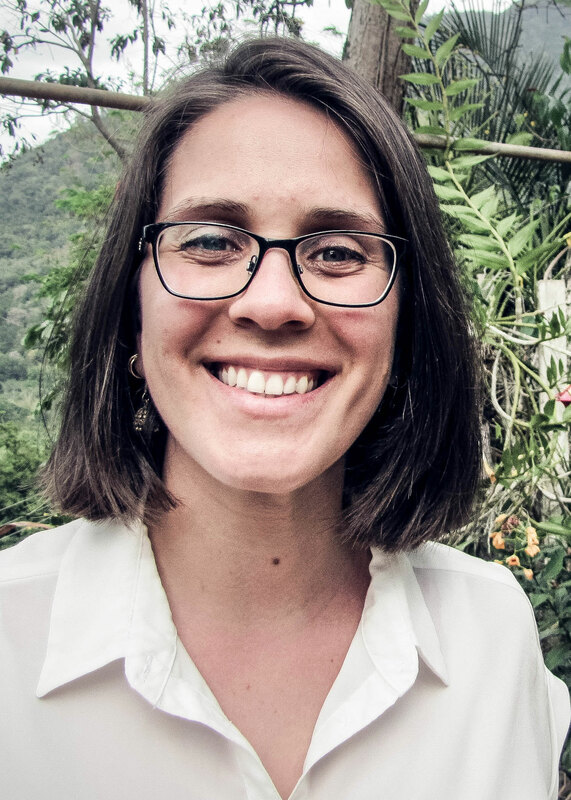 The varied climate and soil present across western South America, from Columbia to Argentina and Chile, has lead to a mixture of distinct ecotypes and genotypes of quinoa, that number over 2000 (Lopez, L.M., et al., 2011). Quinoa is a source of protein, amino acids, minerals, vitamins and antioxidants. It is actually considered a complete protein as it contains all essential amino acids and well as a substantial amount of protein. The high-quality protein found within quinoa between, 12-16% is constituted by water-soluble albumins and globulins with high levels of digestibility, making about 80% of the protein available for absorption when properly prepared (Lopez, L.M., et al., 2011). Starch is the main carbohydrate in quinoa, therefore it is important to properly chew quinoa so that digestion can be ignited in the mouth with the help of amylase (Arneja, L., et al., 2015). Not properly chewing quinoa can lead to discomfort and bloating as its digestion was not able to be fulfilled. Fat content in quinoa ranges from 2-10%, with 70% of the fat being unsaturated fatty acids linoleic and oleic acid as well as omega 3, 6 and 9. The fat content is protected from oxidation by the presence of Vitamin E which acts as an antioxidant (Arneja, L., et al., 2015)(Lopez, L.M., et al., 2011). Below is a chart of the chemical composition of quinoa (100g dry weight) in comparison to three common grains. In most of the common grains consumed today, the amino acid profile is not complete and lysine is often present in the smallest amount. Lysine is required, like all amino acids as a protein building block in the body, however, it is also an integral part of the immune system, it aids in preventing and treating cold sores as well as treating HSV-1 (herpes simplex virus type 1). The lysine content in quinoa is rather high, more than double that in wheat. Quinoa contains all essential amino acids, at adequate levels, making it a great plant protein source when properly prepared. The abundance of histidine and lysine also increase the digestibility of the seed and its protein content (Arneja, L., et al., 2015). Below is a chart of the amino acid content of quinoa (100g of protein) in comparison to two common grains. For being such a resilient crop that requires very little tending quinoa contains an amazing array of minerals. 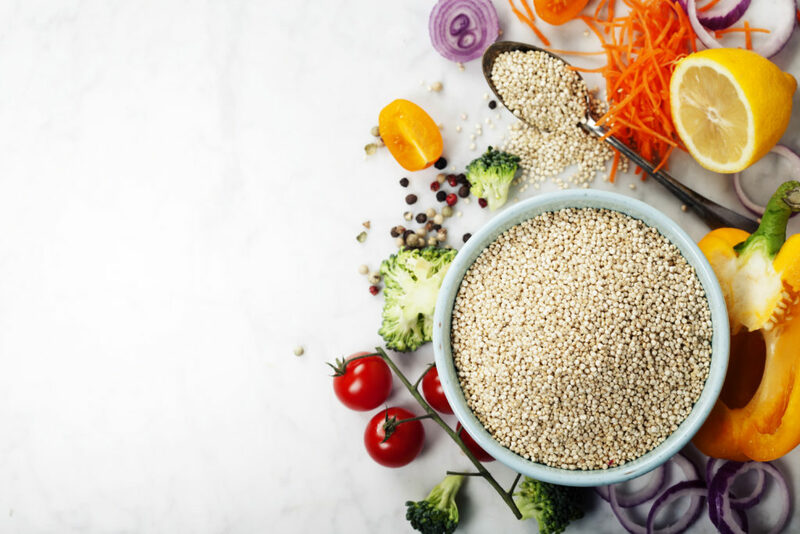 It is important to remember to purchased pre-washed quinoa or to properly clean quinoa so as to remove any antinutrient residue which will prevent certain minerals from being absorbed. Sulphur is distributed throughout the seed, whereas iron, calcium and phosphorus are found in the outer layer. Phosphorus, potassium and magnesium are located in the embryo of the seed (Arneja, L., et al., 2015). Quinoa is also a great source of magnesium and manganese. (Murray, M.T., et al., 2005). What makes quinoa a wonderful plant-based source of protein is that the abundant iron found within it is highly soluble in the body. Although quinoa does contain vitamin C adding in a squeeze of lemon juice to your cooked quinoa will further assist in irons absorption. Below is a chart of the minerals found in quinoa (100g dry weight) in comparison to two common grains. As with minerals so with vitamins is quinoa abundant. It contains an amazing bounty of tocopherols which boost the seeds antioxidant ability. It is abundant in a-tocopherol and y-tocopherol (Bharagava, A., et al., 2013). 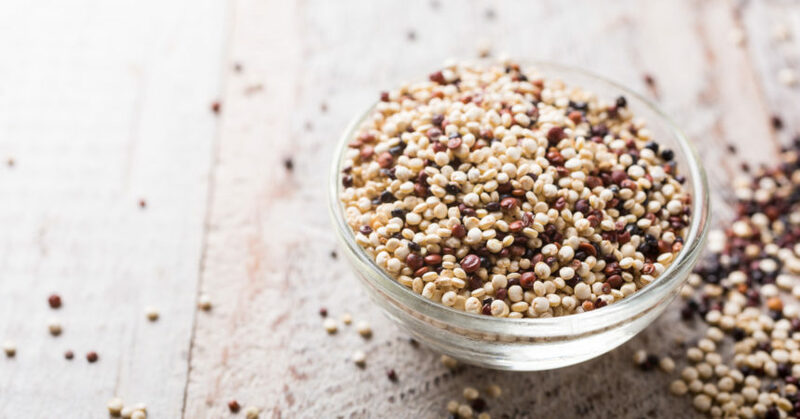 Not only do tocopherols reduce oxidation of the quinoa seed they exhibit powerful antioxidant action on the body, boosting the immune system and preventing oxidative damage and stress to the body. Beta carotene content within the seed is must higher than that of barley and wheat, as is its folate content. The abundance of vitamin C, compared to other grains, aids in making the iron content in quinoa more bioavailable and further improving its solubility. Below is a chart of the vitamins found in quinoa (100g dry weight) in comparison to two common grains. Quinoa is a fantastic source of bioactive polyphenols, which aid in counteracting the effects of oxidative stress on the body. 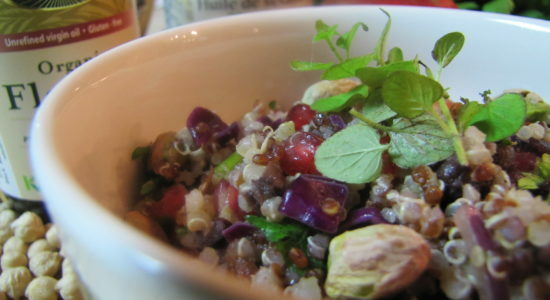 The main polyphenol present in quinoa is gallic acid, which is found in the seed and sprouts. For every 100g of quinoa, there are approximatly 60mg of phenol compounds. Red quinoa has been shown to contain the highest antioxidant, compared to other varieties of quinoa (Arneja, L., et al., 2015). Quinoa is also high in flavonoids such as kaempferol and quercetin. When the seed is sprouted the flavonoid content increases by four times. The antioxidant content in quinoa is increased two-fold when the seed is sprouted. The antioxidant content in quinoa has been shown to increase the antioxidant capacity of blood and reduces oxidative damage to organs such as the heart, kidneys, testes, lungs and pancreas (Sprouting quinoa also makes it more digestible and further reduces the presence of the antinutrient saponins (Arneja, L., et al., 2015). Antinutrients are naturally found in plants. They are there as a plants defence system, to ward off certain animals from consuming them such as birds and mammals. When single stomach animals consume plants with antinutrients, such as us humans, the antinutrients prevent the absorption of certain vitamins and minerals and phenolic compounds from the plant and can also lead to digestive issues. Saponins are steroidal compounds or glycosides, that give quinoa its bitter or astringent taste. They are found in the epicarp or the shell that surrounds quinoa as well as within the cellular walls of the pericarp (Arneja, L., et al., 2015)(Lopez, L.M., et al., 2011). They can negatively affect the gastrointestinal tract of monogastric animals, such as ourselves (Bharagava, A., et al., 2013). Saponins have been shown to reduce plasma cholesterol and bile salt content in the body, this can lead to poor digestion and assimilation of nutrients as bile salts are needed to breakdown fats in food and cholesterol creates the mucosal coating that lines the digestive tract. Saponins can also combine with zinc and iron making them unavailable for absorption by the digestive lining (Jancurová, M., et al., 2009). It is important to waste quinoa in alkaline water or with mechanical abrasion well before cooking, even if the outer shell has been removed. If quinoa begins to foam, this is a sign of saponins. The levels vary between ecotypes, from 0.06-5.1%. Consuming sweet quinoa will have considerably fewer saponins within it. The more bitter quinoa is the harder it will be to remove the saponins (Lopez, L.M., et al., 2011). Tannins are present in quinoa but only in a small amount. When the seed is scrubbed and washed their presence is reduced. Phytic Acid binds to minerals making resulting in a lower absorption rate of minerals from quinoa. These minerals include iron and zinc, therefore it is important for vegans and vegetarians as well as individuals who are low in both minerals to make sure that they wash and properly prepare quinoa prior to consumption. Quinoa is composed of about 0.7-1.2% of phytic acid, a percentage that is decreased by a 1/3 when the seed is soaked and sprouted. (Arneja, L., et al., 2015). Oxalate is a toxic substance found in quinoa and is a potential risk factor for calcium oxalate stone formation as well as affecting mineral and trace mineral absorption (Jancurová, M., et al., 2009) If you have a history of calcium oxalate stones, the most common type of kidney stone, you should limit your intake of quinoa (Murray, M.T., et al., 2005). This function of quinoa is attributed to its dietary fibre content, which is approximately 3% of the seed. Quinoa has been shown to reduce serum and liver cholesterol levels. This benefit can assist in treating and possibly in the prevention of risk factors that are related to cardiovascular disease (Arneja, L., et al., 2015). Quinoa is a gluten-free alternative to common grains, such as wheat, as it contains very little to none prolamin structures as well as low levels of glutamines. Quinoa can be ground into a flour and used as a wheat substitute in baking, it can be used interchangeably with oatmeal when it is made into flakes and can be enjoyed as a breakfast cereal instead of gluten based breakfast cereals. There are several reasons why quinoa is a beneficial food for diabetics. Quinoa is a low fructose glycemic index crop (Arneja, L., et al., 2015) meaning that it will not spike insulin levels after a meal the same way that wheat will. Evaluating blood sugar levels after meals for type 1 and 2 diabetics can lead to complications, such as the development of cardiovascular disease. Consuming low glycemic load meals such as a quinoa salad with lots of fresh raw veggies can greatly help with reducing that after meal spike. The flavonoids present in quinoa help to reduce oxidative stress, which is must higher in individuals with diabetes. Oxidative stress caused by free radicals leads to the destruction of cellular compounds throughout the body. Studies have found that the consumption of flavonoids, which as abundant in quinoa, particularly when it has been sprouted aid in reducing oxidative stress and free radical damage. This reduces inflammation, as well as promoting insulin secretion, both incredibly beneficial for diabetics (Murray, M.T., et al., 2012) (Yao, L.H., et al., 2004). The abundance of flavonoids in quinoa, particularly when the seed is sprouted may aid in boosting the bodys fight against free radical damage. Free radical damage affects the body in various ways from premature ageing, the development and spread of cancer to the development of cardiovascular disease. There is increased research into the effects that flavonoids play on the human body. Numerous flavonoids have been shown to exhibit anticancerous properties, antioxidant effects, the ability to scavenge free radicals and prevent free radical damage as well as assisting in the prevention of coronary heart disease (Yao, L.H., et al., 2004). 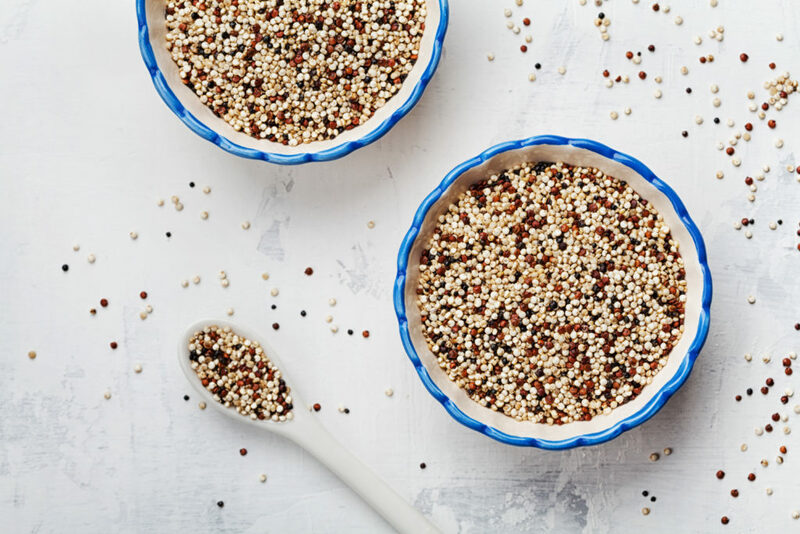 Prior to cooking your quinoa make sure to wash the seeds, using a fine mesh strains, with alkaline water 2-3 times so as to remove the saponins and other antinutrients such as tannins. If you purchase prewashed quinoa, you can skip this, but it is always good to check to make sure that no foam is produced by quinoa when place under running water (this is a sign that there are saponins on the outer portion of the seed). Cook quinoa at a 1:2 ration (seed: water), one cup of dry quinoa will require two cups of filtered water. Add your two cups of water to a pot, cover the pot and bring it to a boil. At this point add in the quinoa to the boiling water, reducing the heat to low and stirring a few times to let the seeds immerse in water. 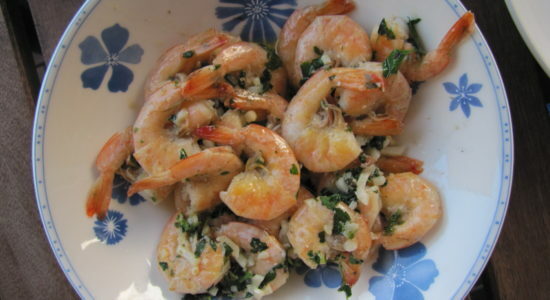 Cover with a lid and let it cook for 15 minutes, you can stir it once or twice during this time. Check on the quinoa after 15 minutes, if the white germ or outer ring of quinoa has separated it means that the quinoa is cooked. Arneja, L., Tanwar, B., Chauhan, A. (2015). nutritional Composition and Health Benefits of Golden grain of 21st Century. Quinoa (Chenopodium Quinoa willd): A Review. Pakistan Journal of Nutrition. Volume 14, Issue 12, pages 1034-1040. Bastids, E.G., Roura, R., Rizzolo, D.A.D., Massanés, T., Gomis, R. (2016). Quinoa (Chenopodium Quinoa willd), from Nutritional Value to Potential Health benefits: An Integrative Review. Journal of Nutrition and Food Sciences, Volume 6, Issue 3. Bharagava, A., Srivastrava, S. (2013). 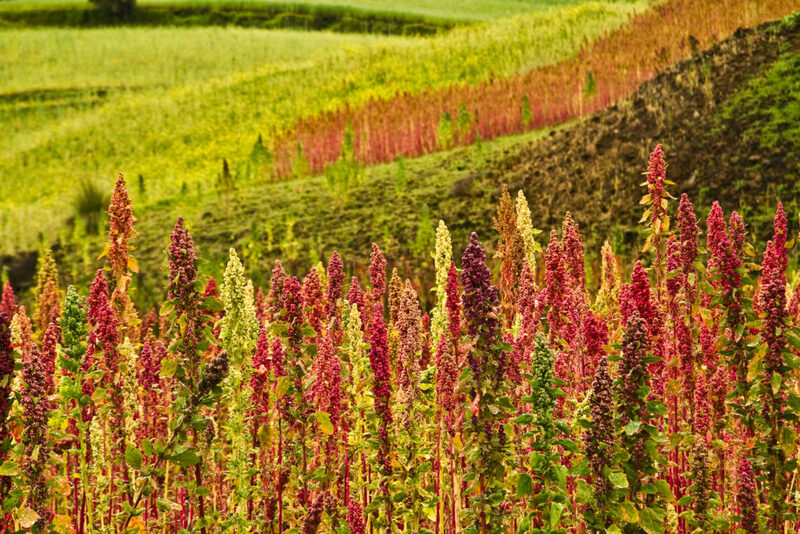 Quinoa: Botany, Production and Uses. CABI: Boston. James, L.E.A. (2009). Chapter 1. Quinoa (Chenopodium quinoa willd). Composition Chemistry Nutritional and Functional Properties. Advances in Food and Nutrition Research. Volume 58, 1-31. Jancurová, M., Minorovičová, L., Dandár, A. (2009). Quinoa – AReview. Czech Journal of Food Science. Volume 27, Number 2, pages 71-79. Lopez, L.M., Capparelli, A., Nielsen, A.E. (2011). Traditional post-harvest processing to make quinoa grains (Chenopodium quinoa var quinoa) apt for consumption in Northern Lipez (Potosio, Bolivia): Ethnoarcheological and archeobotanical anlaysis. Archeol Anthropology Science. Volume 3, pages 49-70. Murray, M.T., Pizzorno, J. (2012). The Encyclopedia of Natural Medicine. Atria Books: New York. Murray, M.T., Pizzorno, J. (2005). The Encyclopedia of Healing Foods. Atria Books: New York. Navruz-Varli, S., Sanlier, N. (2016). Nutritional and Health Benefits of Qunia (Chenopodium quinoa willd.) Journal of Cereal Science. Volume 69. pages 371-376. Yao, L.H., Jiang, Y.M., Shi, J., Tomas-Barberan, F.A., Datta, N., Singanusong, R., Chen, S.S. (2004). Flavonoids in Food and Their Health Benefits. Plant Foods for Human Nutriton. Volume 59, Issue 3, pages 113-122.